In case you haven’t read, a good portion of the United States will be under part of the path of the moon’s shadow for a total eclipse of the sun on August 21st. I’m very lucky in that I’ll be close enough to the path of totality to probably have a 99% experience. Many years ago, I was near the path of a solar eclipse, but well away from the path of totality — near this map’s N in Maryland — and I still remember the dimming of the afternoon light. That eclipse was way pre-Internet, so we didn’t have the daily buzz of Facebook updates, all the websites, and the sale of eclipse-viewing glasses to keep us jazzed in the weeks before the event. (last week, I bought enough ISO-rated specs for the entire family at a local science museum) I must have known about the 1970 eclipse, but I was indoors when it happened. Despite me being in the house, and despite the lack of eclipse-capable photo equipment, that partial eclipse was impressive. Skipping to the present, in a recent Facebook discussion, an online friend was saddened because she wasn’t able to buy a filter for her camera in time. She’d like photos of the eclipse, but thinks that ruining her camera’s sensor by aiming it at the sun without filters is rather a high price to pay for (maybe) a snapshot. I tend to agree. (!!!) I suggested that she could make an old-old-fashioned pinhole camera and take photos of the images made with it. Luckily, I can provide instructions. Years ago, but not as many years ago as the eclipse I experienced, I made a camera obscura ‘just because.’ I had recently concluded homeschooling three of my four kids and was apparently suffering withdrawal from science projects. As the withdrawal and the project both happened during the Age of the Internet, I have online pictures of my fun at another of my blogs, Happy as Kings (the instructions I mentioned). 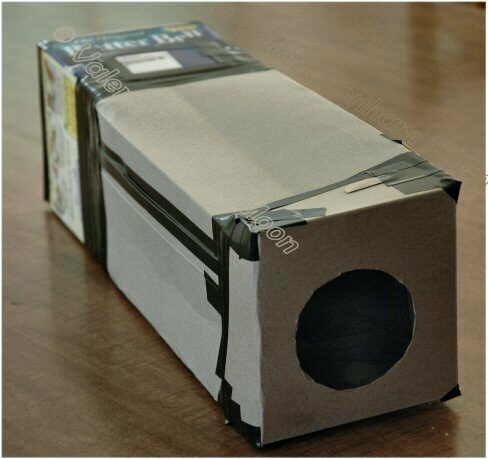 A pinhole camera I made from a couple of pasteboard boxes, a sheet of typing paper, and some electrical tape (because it’s lightproof). The large hole isn’t the pinhole, but is the opening for my digital camera so I could take pictures of the pinhole images. If you don’t have filters for your cameras or for your camera phones and you want to take pictures of the eclipse, give the pinhole camera a try. — and so you’ve had a few dry runs for experience. Good luck, and happy eclipse viewing.